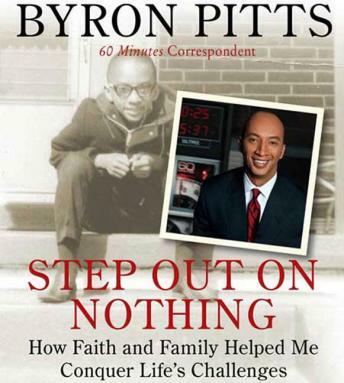 In Step Out on Nothing, Byron Pitts chronicles his astonishing story of overcoming a childhood filled with obstacles to achieve enormous success in life. Throughout Byron's difficult youth-his parents separated when he was twelve and his mother worked two jobs to make ends meet-he suffered from a debilitating stutter. But Byron was keeping an even more embarrassing secret: He was also functionally illiterate. For a kid from inner-city Baltimore, it was a recipe for failure. Pitts turned struggle into strength and overcame both of his impediments. Along the way, a few key people 'stepped out on nothing' to make a difference for him-from his mother, who worked tirelessly to raise her kids right and delivered ample amounts of tough love, to his college roommate, who helped Byron practice his vocabulary and speech. Pitts even learns from those who didn't believe in him, like the college professor who labeled him a failure and told him to drop out of college. Through it all, he persevered, following his steadfast passion. After fifteen years in local television, he landed a job as a correspondent for CBS News in 1998, and went on to become an Emmy Award-winning journalist and a contributing correspondent for 60 Minutes. Not bad for a kid who couldn't read. From a challenged youth to a reporting career that has covered 9/11 and Iraq, Pitts's triumphant and uplifting story will resonate with anyone who has felt like giving up in the face of seemingly insurmountable hardships.